"It was a cold, cheerless night. But in spite of the cold, the street was full of people. They stood on the corners talking, lounged half in and half out of hallways and on the stoops of the houses, looking at the street and talking. Some of them were coming home from work, from church meetings, from lodge meetings, and some of them were not coming from anywhere or going anywhere, they were merely deferring the moment when they would have to enter their small crowded rooms for the night." 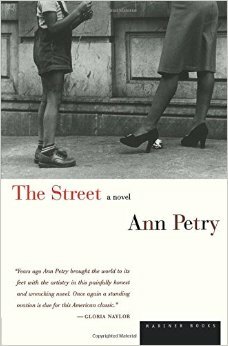 Ann Petry was an American novelist active from 1938 to 1953. The Street was her first novel, and remains her most famous work. In the novel, Lutie Johnson struggles to make ends meet while raising Bub, her young son. Along the way she crosses paths with various street characters, all inhabitants of Harlem on the eve of World War II. The Street is also the story of Lutie's attempt to rise above her environment, and how this environment shapes the choices that all of the characters in the story make. When I first came across this novel, my first thought was of Toni Morrison's novel Jazz. The New York setting was familiar, the characters struggling against the alienation engendered by the city... but The Street is a much more focused novel, and it's almost as if the characters in it have no histories beyond the street they all inhabit. This isn't in itself a bad thing, but I think that where Morrison's novel soars this novel flounders. It also fails to make the kind of defining statement a book like Invisible Man would have made regarding similar themes. Taken all in all, it's not a bad book. It's only that the shifts between different characters can be a bit jarring, and there is also Lutie's disappearance for a long stretch of the narrative near the end. This disappearance lessens the impact that the ending might have had. There is also the fact that Lutie goes out of her way NOT to make friends. This, in my opinion, makes her a less-than-sympathetic character. If this reluctance to form relationships with her neighbors was explained it wouldn't have been a problem, but as it is it draws her motivations into question, to the point where I wondered whether she had really been "painted into a corner" by her environment, or if she hadn't been the one doing the painting. If you liked Jazz or Invisible Man, you'll probably like this book. It starts off great, and doesn't lose steam until the last fourth or so. Just the same, I can't say that it's a home run. Its characters could have been fleshed out a lot better, their motivations could have been described in greater detail, and Lutie could have been given a lot more reason for her life-changing decision at the book's conclusion.